"It is over 20 years since I, with others, first drew attention to the extent and severity of dependence on therapeutic doses of benzodiazepines [tranquillizers and sleeping pills]. The suffering goes on, but Joan Gadsby's well-researched story should help focus public attention on this appalling problem and its solution." "This book is a masterful, lucid and cogent account of the causes and horrific consequences of benzodiazepine dependency." "Addiction by Prescription" describes in vivid and gripping detail how in 1966, when Joan Gadsby's four-year-old son died of a brain tumour, her trusted family doctor prescribed a "chemical cocktail" of tranquillizers, sleeping pills and anti-depressants. It was the first step in her twenty-three-year addiction to benzodiazepines  an addiction which threatened her family relationships, financial security, career and personal health. As a result of the drugs' side effects, Gadsby was on various occasions arrested, restrained, sedated, jailed and written-off as having an "alleged" psychiatric disorder or alcoholic. It was only after she almost died following an unintentional overdose in 1990 that she stopped taking the drugs, and tackled the horrors of withdrawal on her own without medical supervision from her former doctor who refused to help. "Addiction by Prescription" documents the author's life before being prescribed the drugs, while she was taking the drugs, her protracted and harrowing withdrawal of 2 years, her realization that her cognitive functioning had been seriously impaired by the drugs and her concerted and lengthy efforts at cognitive retraining. The author discloses the systemic denial she encountered amongst the medical profession and her extensive, decade-long international research in her quest to expose the shocking truth of the extent of addiction by prescription and the devastation of millions of people's lives worldwide who suffer needlessly from "doctor induced" or iatrogenic illness. "Addiction by Prescription" further describes how the author  a former Marketing Executive for 28 years with 4 of Canada's largest companies and a former poll-topping elected Councillor for 13 years  has rebuilt her health, her life and her family over the past 12 years off the drugs. Her extensive economic losses and damages of over $2 million and her "bungled" lawsuit against her former family doctor are also well documented in the book. The book includes extensive historical and current international research references, interviews with thousands of consumers, doctors, health-care professionals, drug company representatives, pharmacists, government officials and politicians worldwide. The author has emerged as a tireless advocate, educator, consultant and international authority on the responsible prescribing and informed use of tranquillizers, sleeping pills and anti-depressants. 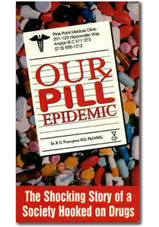 A "Call to Action" chapter includes the identification of 14 key obstacles to reducing the benzodiazepine problem and outlines strategic multi stakeholder solutions to resolve the problem which call for a higher standard of ethics and accountability by doctors, drug companies and political decisions-makers. 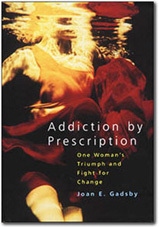 Not since "I'm Dancing As Fast As I Can," describing Barbara Gordon's "cold turkey" withdrawal from Valium, which became an international bestseller in 1979, has a book so powerfully addressed prescription drug addiction and its devastation of people's lives. Joan Gadsby is also Co Executive Producer of the television documentary "Our Pill Epidemic: The Shocking Story of a Society Hooked on Drugs," which is available on video and for international broadcast.